This Billy Joel hit from 1983 is still a favorite with audiences and singers. 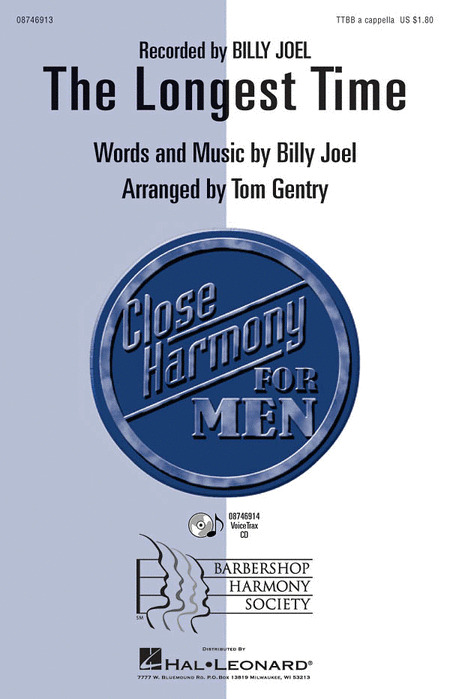 This Barbershop arrangement will be the hit of your show!Available separately: TTBB a cappella and VoiceTrax CD. Performance Time: Approx. 2:30. Its always fun to sing in close harmony so let's be sure to also sing some really fun songs! Ricky Nelson's 1960's hit "Hello Mary Lou" is a natural for the tight harmony found in this well-crafted barbershop version. Thie Billy Joel hit "The Longest Time" from 1983 is still a favorite with audiences and singers. This Barbershop arrangement will be the hit of your show! The humorous doo-wop hit "Who Put The Bomp (In The Bomp Ba Bomp Ba Bomp)" from 1961 is arranged by the masterful Aaron Dale and is a treat for any quartet to sing. "Bohemian Rhapsody" - This arrangement is an absolute winner! Deke has the wonderful talent of creating arrangements that beginning quartets can sing while simultaneously being very rewarding for more experienced singers.